The AARC vision and planning stretches back more than 20 years. 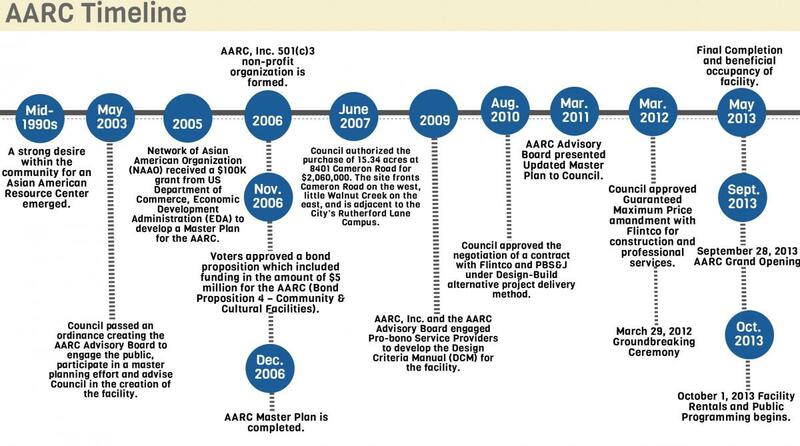 Below you can see the timeline from vision to emergence of the AARC facility as it stands today. The original AARC Master Plan was completed in 2006. Below the timeline you can review the scanned Master Plan in parts. The Master Plan update will provide several opportunities for the community to provide input and comment on the process. The process will include stakeholder meetings, open houses, small group conversations, surveys, and online updates. In addition, there will be multiple opportunities to share on SpeakUp Austin! Check back regularly for updates about the design and upcoming community events. Master Plan Timeline can be viewed here. Master Plan Values Concept Questionnaire - Provide feedback on Concept A and Concept B here. Request a language interpreter by calling 3-1-1 no later than five days before the meeting you wish to attend. Yêu cầu thông dịch viên bằng cách gọi số 3-1-1 trễ nhất là năm ngày trước buổi họp quý vị muốn tham dự. اطلب مترجم لغوي عن طريق الاتصال بالرقم 3-1-1 في موعد لا يتجاوز خمسة أيام قبل الاجتماع الذي ترغب في حضوره. 참석을 원하시는 회의일 최소 5일 전까지 3-1-1로 전화하여 통역자를 요청하십시오. For more information, please contact Gregory Montes, Park Development Coordinator, at AARCMP-update@austintexas.gov or call 512-974-9458.